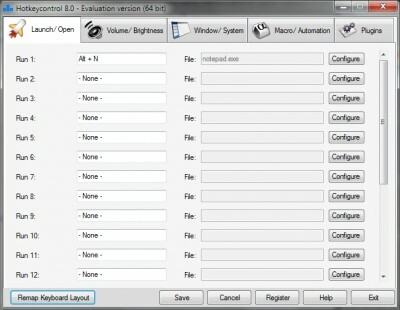 XPHotkeycontrol XP is a software to customize hotkeys (or single keys) for specific purposes. It will make any keyboard to work as a Multimedia or Internet keyboard. It can also be used to change volume with On-screen-display or display in tray icon. You can customize your keyboard for almost any action. Using iOSD, any animated gif file can be used to display the volume status on screen. Also,using iOSD, any bitmap can be displayed on the screen conveniently using hotkeys. You can play/eject audio CD`s,hide/close/keep active window on top or shutdown/restart/logoff your computer. You can also send keystrokes which may be used to type in frequently used text. Also programs can be run with optional command-line parameters thus increasing the program`s functionality.You can also control your browser and any media player with hotkeys. All these hotkeys can optionally be made active only when a given combination of Num,Caps,Scroll lock are on or off.This helps in reusing the same hotkeys for more than one purpose depending on the lock keys. The main feature of Hotkey control which makes the program better compared to its rivals is that all the hotkeys are functional even in games and in other full-screen Direct 3D applications. Even the additional keys on your Multimedia/Internet keyboard can be used with Hotkeycontrol XP thus making Hotkeycontrol XP even more useful for people with Multimedia keyboards. KeyExtender is a Windows program which can extend you key function. Keyboard Tweaker is a Hotkeys manager. Winkey MX is an advanced keyboard hotkeys management application, it allow you to create and manage fast and easy keyboard shortcuts hotkeys for your your favorite URLs, Files, Programs and Windows most used tasks such as power routines, shell exploration Multimedia commands (screen resolution, shell audio volume. HotKeyz helps the user to work more efficiently and productively. HotKey Manager is a free and useful tool that comes with many features. Active Keyboard is a utility that generally accelerates your normal computer workflow. Customize your keyboard, joystick, and mouse with an open source scripting language (AutoHotkey) that is backward compatible with AutoIt v2.